Art Review: "New England Plein Air Painters," Bryan Memorial Gallery, Jeffersonville. Through October 26. Working en plein air - that is, outdoors - has been a favorite approach of landscapists for 150 years. Artists who migrated in the 1840s to the town of Barbizon, east of Paris near the Fontainebleau Forest, were the most prominent early exponents of plein-air painting. They stressed realism over romantic interpretations of idealized natural environs. The exhibition "New England Plein Air Painters," at Bryan Memorial Gallery in Jeffersonville, demonstrates that open-air painting is alive and well in modern times. Two 12-by-16-inch paintings by Connecticut artist Leonard Mizerek are notable for their elegant simplicity. "Tranquil Eve" is a winter seacoast scene, and "Nature's Blanket" presents a hillside farm in winter. While his canvasses are small, Mizerek often uses broad brushes to accentuate the energy of his compositions. Winter snows are prominent in the show - and, yes, the plein-air painters really did work outside in the cold. Vermonter Eric Tobin's "Winter Light" is a 40-by-48-inch oil, rich with impasto paint application. A strong diagonal in the form of a frozen creek cuts across the foreground. Pale smoke rises from the yellow farmhouse's chimney, just as puffs of the artist's frozen breath rose. Tobin's "Emerging Spring" depicts a slightly warmer time; the 20-by-24-inch composition focuses on a brown hillside before trees have budded and when contours of the land are most prominent. Several of the works in the show draw on local views. Christopher Magadini's "Bryce Farm" comes from the Pleasant Valley area of Cambridge, Vermont. The picture plane of the 12-by-16-inch portrait of a farm on a dirt road is deepened by the sfumato of aerial perspective, with values growing paler in the distance. A bright dash of red on the English-style barn heightens the intensity of foreground hues. A father and son, Tom Nicholas and T.M. Nicholas, respectively, both captured the Chase Farm in North Cambridge. Shadows and clouds make it apparent the pair was working from the same point of view - if not at the same time - on their 9-by-12-inch canvasses. The elder Nicholas presented the tops of the trees behind the barn as a swag of green, framing the crest of Mount Mansfield in the distance. His son took a more linear approach: Diagonals in the roof lines, and from a hill at right, bring the eye to a point left of center in the composition. Massachusetts artist Robert Duffy is one of the most expressive colorists in the show. 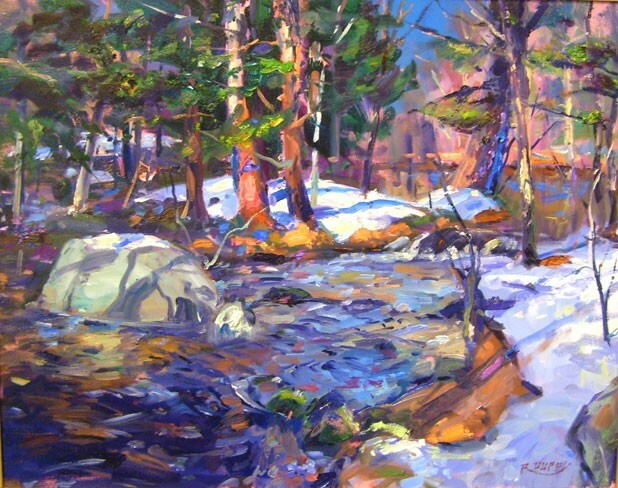 His 22-by-28-inch oil "Last Snow" presents accents of lavender and an acidic cobalt in the twisted details of a freshly thawed stream running through forest shadows. Duffy's vertically oriented "Winter Shadows," with the same dimensions, calls attention to subtle red-brown patches on a wide tree trunk growing above craggy rocks on a hillside. Duffy's shadows are palpable, as if they were living objects inhabiting the forest floor. Two important technical innovations made open-air painting more viable in the mid-19th century than it had been. First and foremost was the advent of paint in tubes. Earlier artists mixed linseed oil and pigments themselves, and it was a cumbersome process. The second innovation was the French easel, also called a box easel. When easel, palette and drawers for paint could collapse into a transportable unit about the size of a briefcase, bringing one's studio into the fields was a much simpler task. Given that new technologies were integral to the vitality of early plein-air painting, it's somewhat ironic that painting landscapes outdoors seems old-fashioned today. Still, the wonder of realism in painting will never go out of style.